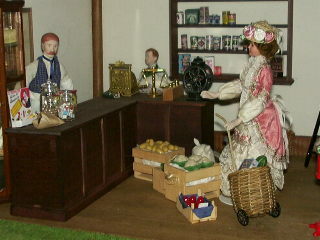 This is the grocers shop at the base of my York Shambles house. The lady usually resides in the wedding dress shop. 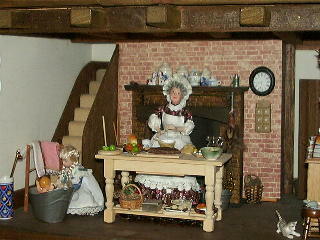 Unfortunately I cannot 'do' dolls, so buy them ready made! This is a picture of Noni's visit to see us! Sorry about the picture - not one of my best. Noni had been a long way around the world and was sharing recipes with Mrs B!! This is the next floor up. The kitchen area. 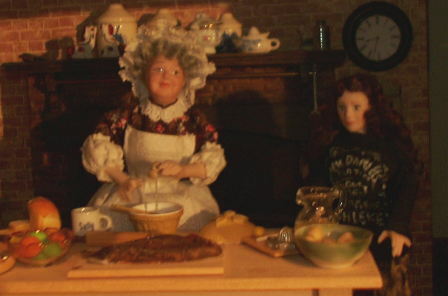 You can see the cook, and her grandaughter, bathing the little baby. 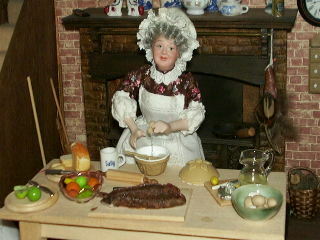 The cook is making cakes! This a closer look at her table. I made the apples on the cutting board! And the fruit in the glass bowl.